The Vintage Concert Audio idea was born at Pro Light + Sound fair in Frankfurt 2018 by Wolfgang “SCHABBACH” Neumann . The basic idea was to show vintage concert audio equipment to younger generations and give them a chance to experience how it sounds and how to operate it. Because organizing a project like this is a lot of work Wolfgang “SCHABBACH” Neumann (SCHABBACH Enterprises & 8days a week) teamed up with Markus Pohl (ISDV e.V.) and Jürgen Desch (DESCH Audio GmbH) to get this VCA project started. After the first meeting with the ProLight + Sound team Thomas Spanier (Floh Service GmbH) joined the VCA party. 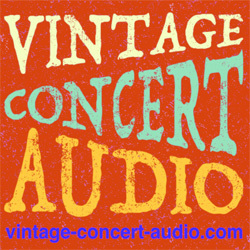 The Vintage Concert Audio e.V. was born. “We want to preserve the heritage, the culture and the knowledge of the analogue concert audio technology and concert audio industry and pass it on to interested people” says Wolfgang “Schabbach” Neumann (VCA president). ISDV – The Professional Association of Self-employed Service Providers in the Entertainment Industry – and VCA – The Vintage Concert Audio Show & Experience – have partnered for a joint-forces booth at the Prolight & Sound / Musikmesse 2019. The ISDV & VCA show the Millennials over 200 exhibits on 2.400 square meters exhibition space, among them all milestones of the Concert-Audio history of the 1960s, 70s, 80s and 90s. Visitors can see how the world looked like before LineArrays and digital desks. Technicians and engineers get their hands back on their “toys” from before the 2000s era. The organizers have collected the exhibits in the deepest cellars and from the farthest warehouse corners in Europe to bring them together in Frankfurt. Everything, from the first WEM, Vox and Marshall PA-systems to Martin Modular, Meyer MSL3, Clairbrothers S4 to the first L’Acoustics line array, will be represented. And in many parts even audible: every day a decade-bound audio panel will be taking place. Sound engineers of the respective time will tell their story, will philosophize about the technology and, of course, answer the questions of the booth visitors. The ISDV and VCA will be organizing panels with daily changing content and discussion partners from politics, science and industry on topics of “labour and social affairs”. Daily rates will be discussed as well as false-self-employment or the future of our industry. Each night, a get-together will be taking place, where the VCA presents an original set-up of a contemporary PA to invite you to listen and try out. You can experience live recordings from tape recorder, vinyl and compact cassette. The ISDV and Vintage Concert Audio Show booth 2019 will be in FORUM / Festhalle at ProLight + Sound Frankfurt.